Hailing from Canada and taking up home in Italy, luxury label DSqaured2 has just opened the doors on its first UK standalone store, in the heart of London’s Mayfair. 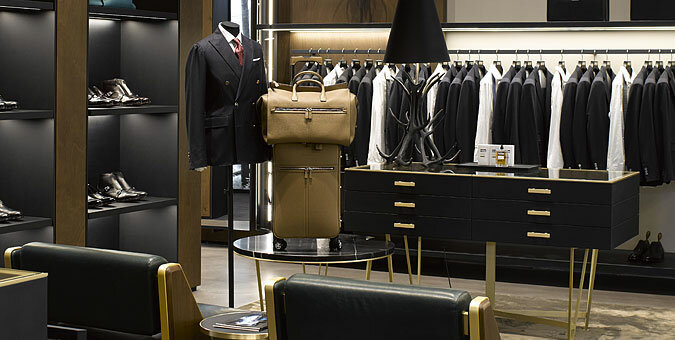 Situated in the midst of the capital’s world renowned Savile Row tailoring district, the flagship spans 8,612 square feet across three floors, playing host to the brand’s full mens and womenswear collections. For the gents, DSqaured2’s casual pieces grace the basement level – including trainers, denim and eyewear – while its Classic collection takes up home on the ground floor, offering Italian tailored suits and tuxedos. Interior design comes courtesy of Milanese architects Storageassociati, who developed a subtle forest and nature theme to reflect its founding brothers’ Canadian heritage. Head to the fitting rooms and you’ll see waxed tree trunks used as chairs, while lighting features are formed from antlers and the anthracite flooring features a forest trail-like pathway. Brass accents, velvet upholstery and glossy furniture round out the aesthetic, adding a luxurious touch. You can visit the DSquared2 London store now at 51 Conduit Street, Mayfair, London.